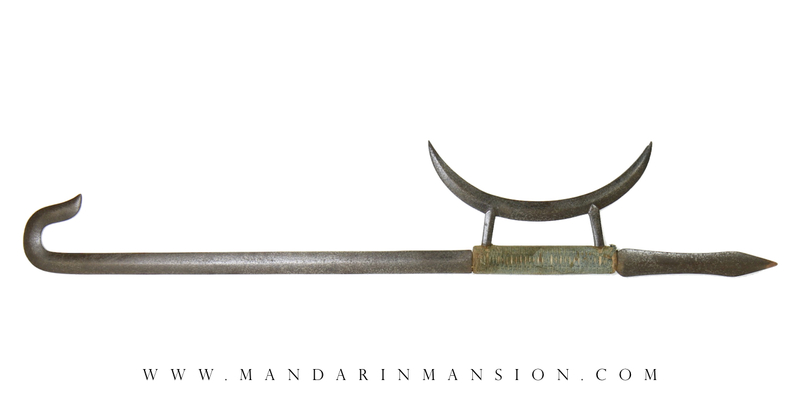 Chinese hook swords are usually called shuangguo (雙鉤), literally "double hooks", and are usually encountered in pairs. However, they may not have always come in pairs because there are some martial arts routines that only use one. Lore aside, they never seemed to have fulfilled any kind of military role. Many martial artists made a living performing shows of martial arts, often with fanciful weapons to draw in crowds and I've had examples with unhardened blades that seemed to have been made for that purpose. That said, enough of these exist that are made of serious, forge folded and well-tempered steel to suspect a true martial application as well. Such pieces would have been very expensive at the time, a lot more expensive to make than simpler forms of swords and sabers. Also striking is that when they are good, the geometry is really rather precise. There are no shoddy versions around. There is even a set of them in the Palace Museum in Beijing, indicating that someone at court had an interest in them as well, even though perhaps just for training and health purposes. Because literally everything that sticks out from them is sharp, and because they need plenty of room to be used, they are of little to no use in formations. I can picture them as a weapon mostly in a situation where a single person expects to have to face multiple attackers. The hunt is on for reliable sources that can shed some light on the matter. This Chinese hook sword was found alone. I am unsure whether it lost its counterpart, the most likely scenario, or whether some did indeed see use as single weapons. Among the genre, this one is actually rather well made. It has good patina all around, and with faint hints of a subtle wood-grain pattern forge folded construction. The steel is very well-tempered, gently vibrating when tapper. The contours and bevels are very precise on this piece, and it has good edge geometry with plenty of "meat" behind the sharp edges. The elegantly shaped and thick crescent moon is forge-welded on two bars that disappear into the handle. 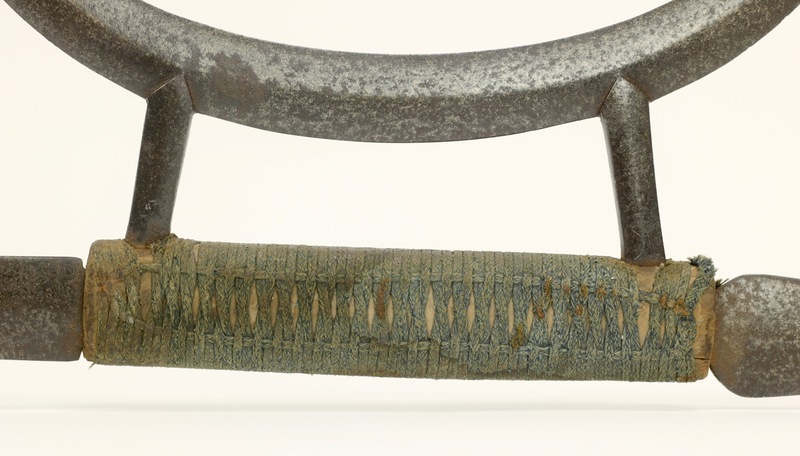 The handle is still largely intact, and retains its original blue-green cord wrapping. This would orignally have been a dark indigo blue, which tends to fade to a greenish tint over time. This is the same type of wrapping as found on some military sabers of the 19th century. The cord has the kind of staining you'd expect to see from a piece that was handled a lot. Someone put lots of training in this piece. 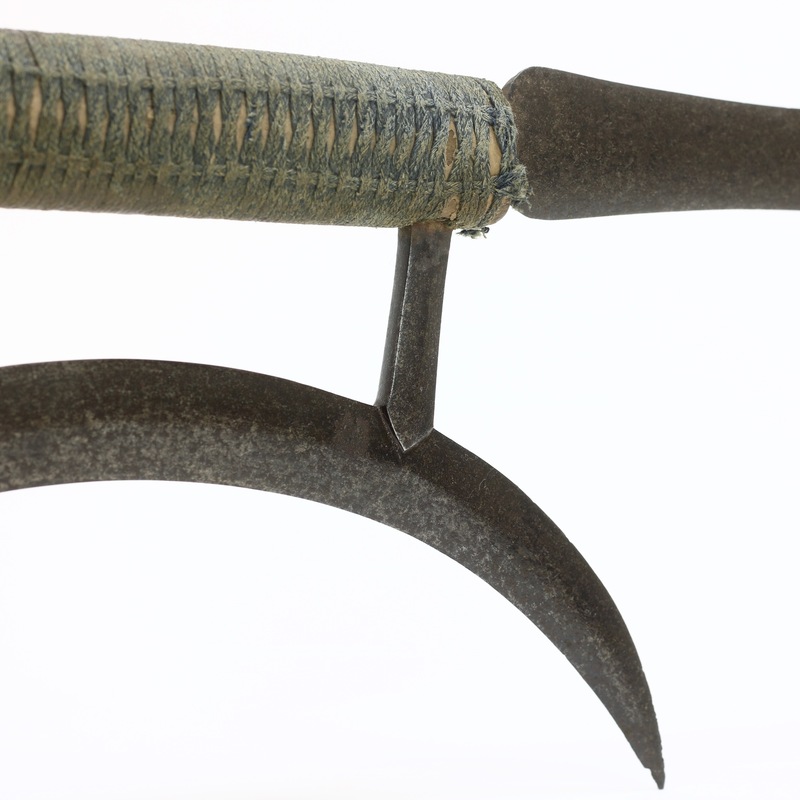 A nice example of a Chinese hook sword. It is of very good quality manufacture for one of these, with great functional geometry on all parts and made of well-tempered, forge-folded high carbon steel.